Sean Paul’s distinct voice, catchy rhythms and first class production, have been the perfect blend for the success of this Grammy Award winning, international superstar. Born Sean Paul Henriques in Jamaica on January 9, 1973, his musical career took off in 2002 with the success of his second studio album Dutty Rock, which was fuelled by his Billboard Hot 100 chart toppers, Gimmie the Light and Get Busy. Sean Paul has maintained his relevance in the music industry since his rise to international fame in 2000 to present day with recent hits such as Cheap Thrills, Rockabye, No Lie, and Body.Sean Paul attended the University of Technology, Jamaica with hopes of pursuing a profession in Hotel Management but his love for music was more powerful. His recording career began in the late nineties with the premiere of his single, Baby Girl. In 2000, Sean Paul released his debut album Stage One with VP Records. To date he has released six studio albums, the last five of which are Grammy Nominated. The albums include Dutty Rock, 2002; for which he won the Best Reggae Album Grammy Award.The Trinity, 2005, was certified platinum in Europe and by the Recording Industry Association of America. 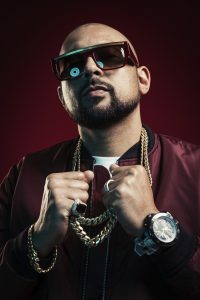 He also went on to release Imperial Blaze, 2009; Tomahawk Technique, 2012, and the most recent Full Frequency in 2014, which were all well received.Sean Paul’s hard work and dedication over the years has earned him several Grammy and Billboard Music Award nominations. His accomplishments include an American Music Award, MOBO Awards, Soul Train Awards, MTV Music Awards, ASCAP Rhythm and Soul Music Awards, a Source Award and a BET Award. He is the only Jamaican artiste to have won an American Music Award (2006) for Favourite Pop/Rock Male artiste and also the first Jamaican to be featured on the cover of Vibe Magazine. Sean Paul enjoys such accolades but is keen on remaining humble and making his fans proud.The success of his albums and his affinity for live performances have brought him much fame. In addition to being the first Jamaican artiste to perform in Kazakstan as well Madagascar, the multi-platinum artiste has ignited stages in well over 100 other countries, performing for huge audiences in some of the biggest venues around the world.While cemented in reggae and dancehall from his home country, Sean Paul maintains a multi-national presence with numerous collaborations in genres such as EDM, soca, pop, afrobeats and Latin. The cross-over icon also boasts a remarkable fan base in Latin America, Japan, Europe and USA. In 2014, his relationship with Spanish audiences spiked after an alignment with both Puerto Rican Reggaeton singer Farruko on the single Passion Whine, and global recording sensation Enrique Iglesias who contacted Sean Paul to partner on Bailando. The latter peaked at number one in 33 countries and its music video generated millions of views on YouTube.Over the span of his career, Sean Paul has worked with quite a number of international and local hip-hop stars such as Busta Rhymes, Beyoncé, Rihanna, Keyshia Cole, Kelly Rowland, Juicy J, 2Chainz and Nicki Minaj. He has also partnered with reggae and dancehall acts such as Damian ‘Junior Gong’ Marley, Wayne Marshall, Ce’Cile, and Tami Chynn.Aside from being a top notch performer, Sean Paul is an excellent music producer and has created music with a number of top Jamaican artistes. Konshens, JCapri, Cham, Beenie Man, Bounty Killer, Elephant Man, Ding Dong, Vanessa Bling, Mr. Vegas, and Denyque, are just a few of the multi-talented artistes featured on his Full Speed Riddim that was released in early 2015.When not in the studio or on stage, Sean Paul likes to keep active with a round of tennis. He also enjoys intellectual conversations, drinking herbal tea and watching or participating in sports like basketball and swimming.